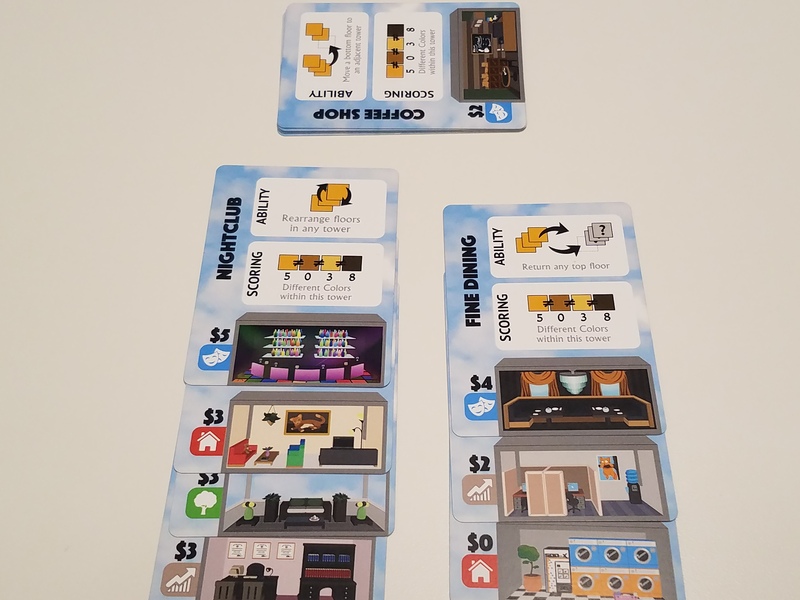 Supertall - A Tiny Tower-building Game is yet another Button Shy microgame that looks to replicate a big-game experience in a tight 18 card, 15 minute format. It's surprisingly puzzly for its size, and has a great aesthetic to boot! Well, Button Shy is at it again! The purveyors of all games micro are currently running a Kickstarter for Supertall (which is already superfunded), a new wallet game from Nat Levan (who brought us a whale of a game in New Bedford). 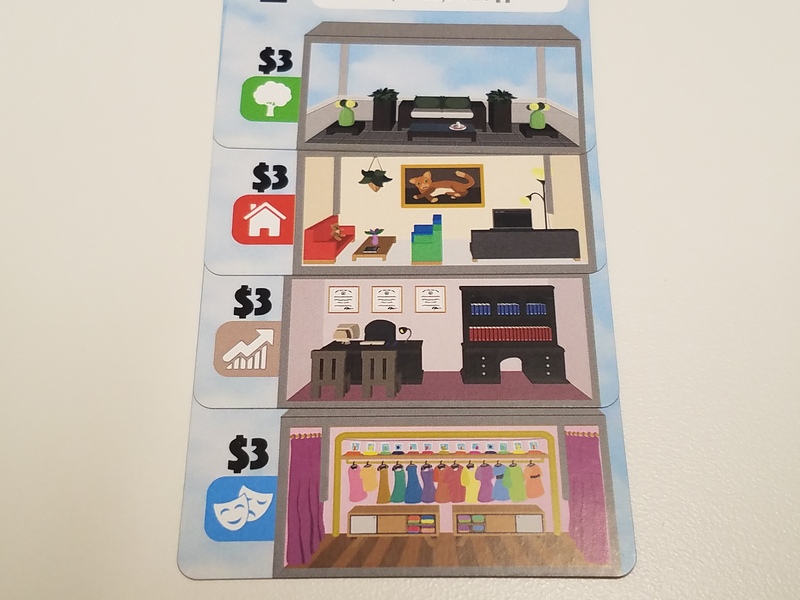 The newest in Button Shy’s line of Wallet Games (which describes their typical method of conveyance), Supertall is a puzzly little game for 2-3 that lasts about 15 minutes. It continues the Button Shy tradition of fast and light gameplay, but does this skyscraper-building card game stand up tall among its micro-peers? Let’s take a closer look and find out! Gameosity received a prototype copy of this game. All images here are either of that prototype or stolen from the Kickstarter Page. 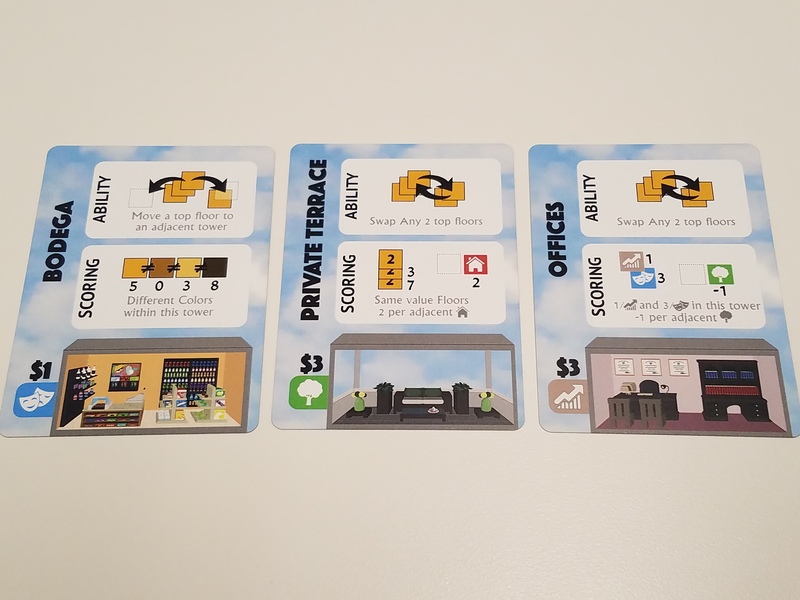 In Supertall, each player is going to be building either 2 or 3 skyscrapers (depending on player count), using the cleverly multi-use cards to either add floors to their towers or to manipulate the cards in towers (both theirs and their opponents). Each potential level of a tower is from one of four building types, and has a value between $0 and $5. You can only add cards to towers by meeting or exceeding their number value, so as players draw cards from the supply, they will want to be strategic in how they use cards to either grow their towers or to move cards around. Andrew: The third way cards can be used, to lobby the mayor’s office, we’ll get to in a moment. At the end of the game, each tower’s value is determined by its top floor suit. Each of the four suits scores differently, considering things like what sorts of towers they are adjacent to, how many floors the tower is comprised of, and the composition of their tower. Jess: What I like about Supertall is how, as you build up your tower, you’ve got to think strategically about how it’s going to come together. For example, if you’ve got a really diverse tower, you definitely want to cap it with an Entertainment floor. But because you’re drawing cards to build your tower more or less randomly, you have to be smart with having a plan B in case you end up not drawing the card you need! When all the cards have been drawn and the towers stand as tall as players can manage to build them, each player will score their towers according to that tower’s rule. Andrew: But there’s a wrinkle in that simple scoring plan, and one that adds a surprising amount of strategy to this little game – City Hall! In the center of the play area is City Hall. This spot can be played to by all players, and is treated like a tower for the purposes of card-manipulation powers. At the end of the game, whatever suit is on top of City Hall will be ‘taxed’. Andrew: …which is to say won’t score any points!?! Jess: That’s just devious! If your opponent(s) have specialized in a single tower type, you can potentially devastate them by playing that card type to City Hall. Andrew: Of course, the same can happen to you, and as cards run out and options get slim, there’s also the nightmare scenario of being forced to play a card on City Hall that will destroy your own point-base! It adds just a little spike of take-that tension that keeps Supertall interesting! Though modest in stature, Supertall is yet another unique, engaging addition to the Wallet Games collection. The one real dig we have against it is, ironically, in comparison to its next-oldest sibling. Sprawlopolis, which you might recall us raving about pretty recently, hits a lot of the same notes as Supertall and does so incredibly well. But since Supertall is competitive and Sprawlopolis is cooperative, it’s more a matter of personal taste. 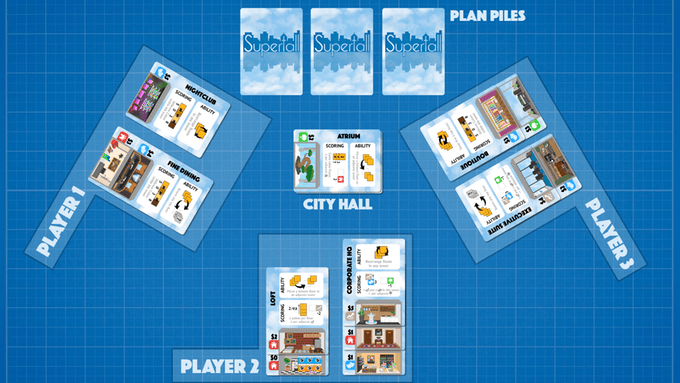 And besides, you can always get a copy of Sprawlopolis added onto your Supertall pledge, so why not both? Supertall continues the Button Shy tradition of packing just enough game into 18 cards to be worth carrying around. It’s crushed its funding goal on Kickstarter and with just a few days left to go already comes with a free expansion! Head on over to the Supertall Kickstarter and get yourself a pocket full of skyscraper today!